This all-in-one kit includes the Awaken G90 multifunction handshower, a 24-inch slidebar, and a 60-inch ribbon hose. Advanced spray performance delivers three distinct sprays - wide coverage, intense drenching, or targeted - with a smooth rotation of a thumb tab. Ergonomic design makes for superior comfort and ease of use, with ideal balance and weight in the hand. The artfully sculpted sprayface reveals simple, architectural forms that complement contemporary and minimalist baths. Awaken G-Series handshower features a contemporary design. Wide coverage spray produces an encompassing spray for everyday use. Intense drenching spray delivers a forceful spray ideal for rinsing soap from hair. Targeted spray is a focused stream for targeting sore muscles or use as a utility spray. At American Standard, it all begins with our unmatched legacy of quality and innovation that has lasted for more than 130 years. It is this tradition of quality and innovation that puts us in three out of five homes in America, as well as, countless hotels, airports, and stadiums. We provide the style and performance that fit perfectly into life, wherever that may be. Also available in store by special order only see store for details. The European-designed Grohe Vitalio Flex Retro-Fit Shower Bar Kit redefines pure shower enjoyment with an all-in-one system that revitalizes you every time you step into the shower. The sleek, contemporary-style kit consists of a fixed 7" Rain showerhead and a 4 inch handshower with a metal hose, as well as a 24-inch rail and all mounting supplies, including adhesive and optional screws. The handshower offers four spray settingsRain, RainO2, Jet and Massageeach optimized with GROHE DreamSpray technology to ensure even, consistent coverage. Ideal for retrofit or renovation, the Retro-Fit System transforms an existing showerhead installation into a luxurious shower system with a showerhead plus the added convenience of a hand shower. The upgrade is quick and easy to install, simply replace an existing shower arm no need to change the tiles or alter any in-wall plumbing. Awaken G90 Handshower Kit, Polished Chrome This all-in-one kit includes the Awaken G90 multifunction handshower, a 24-inch slidebar, and a 60-inch ribbon hose. Advanced spray performance delivers three distinct sprays - wide coverage, intense drenching, or targeted - with a smooth rotation of a thumb tab. Ergonomic design makes for superior comfort and ease of use, with ideal balance and weight in the hand. The artfully sculpted sprayface reveals simple, architectural forms that complement contemporary and minimalist baths. 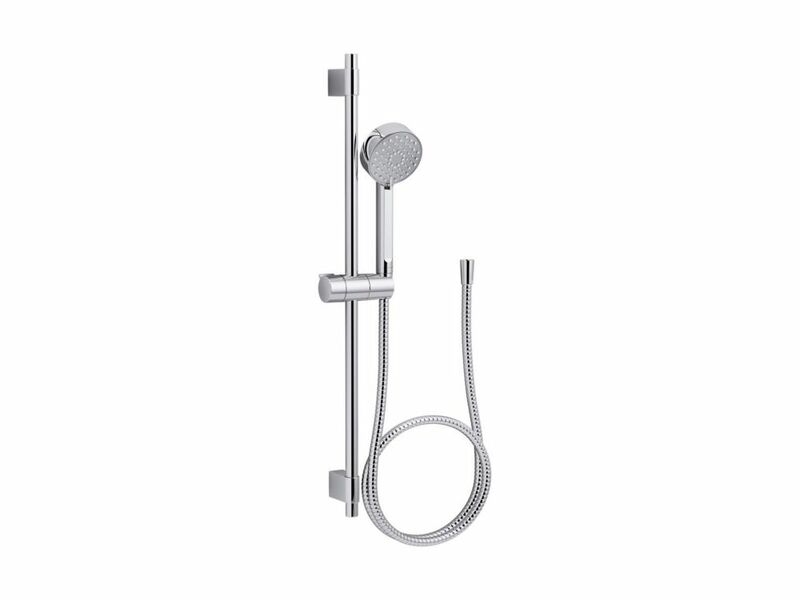 Awaken G90 Handshower Kit, Polished Chrome is rated 4.4 out of 5 by 8. Rated 5 out of 5 by Beachbum from Going to order another one, Love it. Going to order another one, Love it. Rated 4 out of 5 by Peggy from Waiting for the part to be installed but it came... Waiting for the part to be installed but it came in good shape and quickly and sooner then expected. Rated 5 out of 5 by Mike from It looks great with our Schon shower fixtures. Installation was easy if you have the proper tools... It looks great with our Schon shower fixtures. Installation was easy if you have the proper tools. Water flow seems pretty good after I removed the restrictor (in this case a little rubber O-ring). Hose seems decent but it is pretty short. Shower head only fits one way into the holder because it is tapered. Make sure you install the bar right or else you will have to take it back apart and spin it. Rated 1 out of 5 by Tuscarora from The whole assembly made of plastic with poor quality. ... The whole assembly made of plastic with poor quality. The hose is rigid, hard to bent. We returned the products, bought another one made of stainless steal with only $54, about 20% cheaper than the Kohler brand with much better quality. Rated 5 out of 5 by TheThirdCell from Good product for the price. Well constructed. You must read the instructions thoroughly but not hard to follow. I found two problems. The instruction calls for 3/16 tile drill bit. That will not work. It needs a 5/16" drill bit. I had both so it wasn't a problem for me. I contacted Kolher and told them the issue. Also, you need to have a tube of silicon sealant that isn't provided. The instructions didn't say this. I had silicon sealant on hand but if you don't and have to run out to get it in the middle of installation you could be a little bit angry. Again, I contacted Kolher and told them the issue suggesting they make understood upfront that this was not provided. I installed this using a Delta3-Way Shower Arm Diverter with Hand shower outlet so I could have two spray heads and use either one or both.